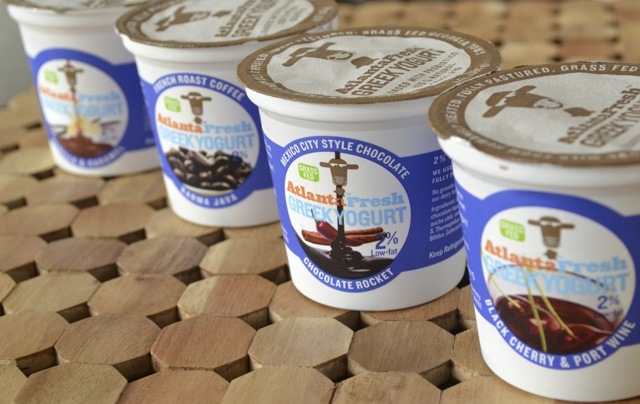 This Greek yogurt from AtlantaFresh Artisan Creamery is the truth! It’s definitely not the typical eat-it-only-because-it’s-good-for-me bland yog, and I definitely do NOT just toss it into smoothies. It’s more like a treat and even – dare I say? – a healthy alternative to ooey gooey calorie-laden desserts. Y’all know I love my rocky road ice cream, but I really dig this yogurt. Black Cherry & Port Wine: (*sigh, swoon, lean back in chair with satisfied look on my face*) This is my very favorite flavor. Deep, rich, complex, sophisticated, and above all YUMMY! Chocolate Rocket: Admittedly, I didn’t read the description thoroughly – all I saw was chocolate! – so the hint of spicy heat surprised my taste buds. For me, I think this would be a great one to serve with strawberries, as a dip. Vanilla Caramel: This one is my fam’s fave. Kudos to AtlantaFresh for getting hub to eat (and enjoy, no less) yogurt. Score! Double Bonus: If you buy a case of 12 from any Whole Foods Market, you save 10%!